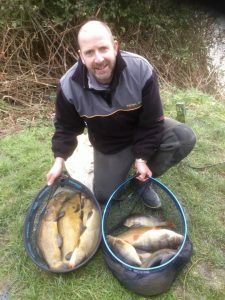 River Kenn Match 3rd March….. 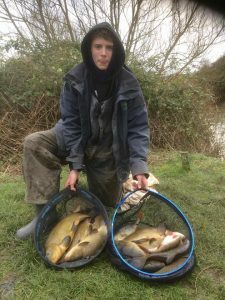 The final Club match of the river season is on Sunday 3rd March, it will be on the River Kenn. 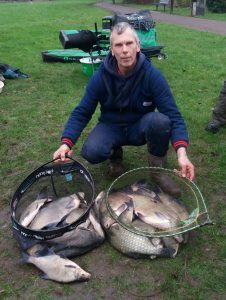 Red letter day on the River Kenn today for Club Secretary Ivan Currie who Fished 10:00 – 15:00 3 pegs above Strode Rd. in Clevedon. 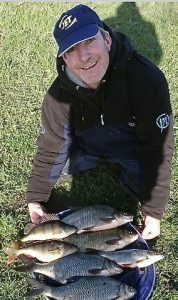 2 roach went 2lb and 2lb 1oz, he had another over a 1lb, and the Perch went 2lb 9oz. 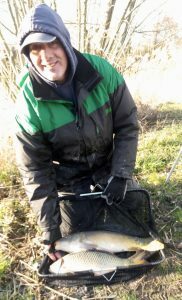 In addition to this he had 4 smaller roach, 3 big hybrids and 11 tench. All weighed on Club scales and witnessed by 3 other Club members. Total weight 52lbs. Wag and mag fishing 4.5 foot deep. 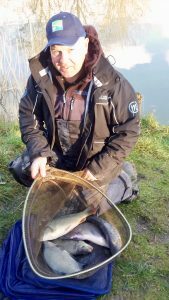 River Kenn continues to provide quality fish. The River Kenn above Strode Rd. continues to throw up unseasonal catches. 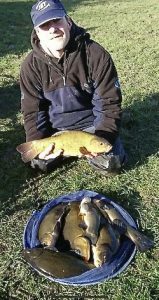 Today (17th Feb) Club Trustee and Committee member Barry Fowler had 11 tench and 2 big hybrids (photo below). 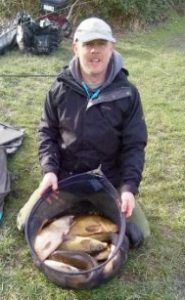 Kev Perry also had 7 tench and a big perch. Double red maggot and waggler is the method so very uncomplicated. CFWAC v Frys AC today (10th February) Horseshoe Lake Kingston Seymour. A very tough day for most but top weights were reasonable. 3rd Mark Bromsgrove Clevedon 17lb mainly roach plus 2 skimmers on the whip! 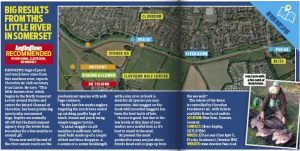 The next working party on the River Kenn is Saturday 23rd February. Meet at Strode Rd. Bridge 09:30 weather permitting. If you can attend it would be greatly appreciated. 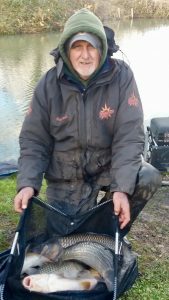 Paul Tedman-Whitemoor returned to the River Kenn again today (27th Jan) and was reward with a great bag of tench and some quality roach. 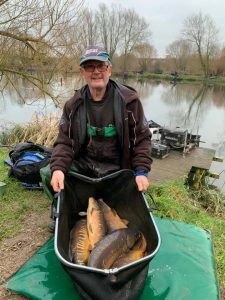 Committee member Paul Faiers done well on Sundays Viaduct Fishery Winter League (20th January 2019) coming 2nd overall in the 90 peg match with 148lb, his team …. ”2nd Time Lucky” also won on the day. Good result mate. 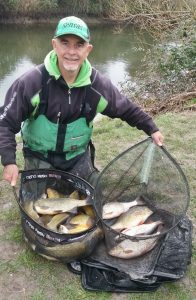 The River Kenn continues to surprise us with big bags of quality fish. On Sunday 13th January Match Secretary Adie Baker and his son Josh had a great 4.5 hours above Strode Rd. Bridge catching loads of big tench and perch all on the waggler and red maggots.